The Service Trades College Australia is an industry owned, not-for-profit, Registered Training Organisation (RTO) that provides contemporary, industry-specific training and professional development for the commercial plumbing sector and mechanical services (air-conditioning) sector, as well as post trade courses for tradespeople. The College operates from a state of the art skills centre at the Construction Training Centre (CTC) in Salisbury (South Brisbane). They also have a smaller campus at Brendale (North Brisbane). They maintain strong links with the Construction, Services and Resource Industries, and Union and Employers Associations to ensure their training is cutting edge and provides value for money. The College prides itself on producing job ready graduates that go on to enjoy successful and fulfilling careers in the service trades. They also pride themselves on working productively with industry to meet any skills shortfall by tailoring courses to meet the needs of employers. Modern classrooms with computer integrated audio visual equipment. Fully equipped workshops with quality tools and vacuumed extraction equipped MIG, TIG and arc welding bays. An operational multiple fire pump room, drawing water from an industry standard bolt panel bolt tank and discharging to ‘real’ fore system equipment. A 4 storey tower that simulates a high rise building allowing the service trades (plumbing and mechanical) to work together during installation, giving students a realistic feel for what they will encounter in the work environment. Blocks are two weeks in duration (shorter period away from employers for training) and 10 Blocks in total. The college utilises E-profiling to monitor student progress in their units of competency. This can also be used by the employer to monitor the apprentice in his/her progress across all streams in the workplace. 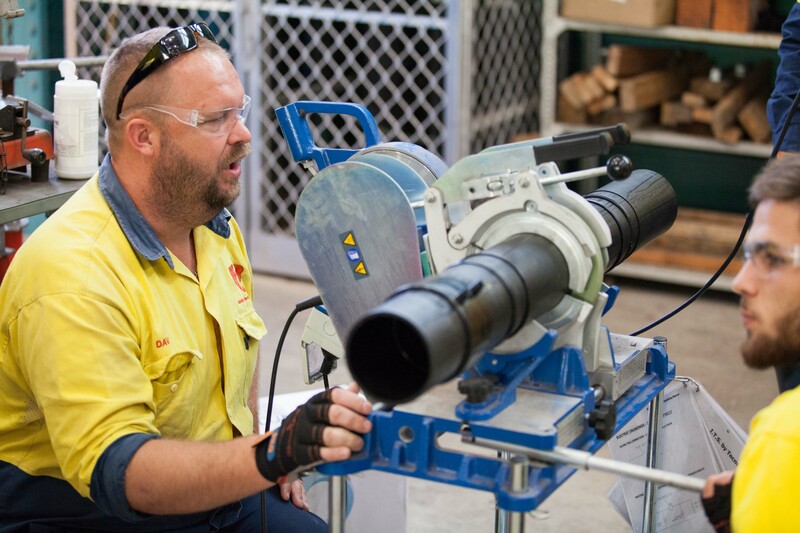 For more information, you can call The Service Trades College on (07) 3255 5698, visit their website, or mail them at PO BOX 102, Salisbury, QLD 4107.